Could there be any greater example for young people watching the first of the semi-finals of Britain’s Got Talent #BGT, than why failing is not the end… it’s just the beginning. 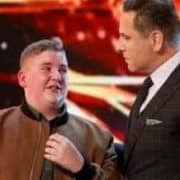 3 years previous to the amazing and very powerful performance from Kyle Tomlinson was David Walliams rejection of him in the initial rounds. Now there’s some question as to exactly what David said and the manner it was taken. But there’s no doubt an incredible lesson here for young people. We are living in a world of ‘least effort’ and this is only becoming more intense for young people and with each generation. The general attitude is, if it doesn’t work the first time – give up. It’s like learning to ride a bike, wobble, wobble, fall-off, then never try again. Only complain and carry the dissatisfaction around, viewing everything through a negative lens. Helping kids and teens to build the muscle of emotional resilience is a necessary part of healthy growth and development. Children who learn how to handle rejection, overcome failure, deal with disappointments and use these as stepping stones and life lessons are more likely to become satisfied, balanced adults. Having someone say ‘no’, ‘you can’t’ ‘you’re not ready’ doesn’t equal the end. And at this point we all have a choice, it’s that moment where we can choose to be defeated by others, listen to defeatist inner chat or we can use it as a stepping stone to success. Of course, there’s the natural roller-coaster of emotions in any failure, disappointment or when expectations aren’t met. And through CHAMPS coaching we always coach kids and teens, it’s ok to feel any kind of emotion as long as it doesn’t control you. Now in those 3 years I’m not sure the process that Kyle Tomlinson went through and from observation, he clearly has supportive family and friends. And I’m sure he went through the roller-coaster of emotions, it can be easy to listen to the negative and be kept shackled to a past that no-longer exists. But in that moment of David Walliams advice, Kyle Tomlinson made a choice, he was going to use this experience as his chance to grow, to develop to show the world what he was here to do… to sing! Accept – we can’t change the situation, but we can change our attitude. Accepting the situation doesn’t mean giving in, or being defeated, it stops the painful resistance and makes room for progress. Action – Create a positive plan of action to improve, grow, develop and achieve more than you imagined. In whatever way David’s advice was given those few years ago, I’m sure looking back Kyle would admit it was one of the best things that could have happened to him. Maybe he wouldn’t have performed such an amazingly motivating performance without it. 19 Towels, a Bath Robe and a Psychological Lesson About Sexting Venus Voice Asks Annette For Tips.